Devious Standards is the second essay collection from Jamy Ian Swiss, and it contains twenty of the most acclaimed essays from one of magic’s most distinguished and celebrated authors. When it was first published, Devious Standards received rave reviews in Magic, Genii, and Linking Ring, and it continues to garner praise from magic’s brightest lights. Vanishing Inc. Magic is proud to offer Devious Standards in a new edition, with brand-new typeset, layout, and cover design. This volume now matches Shattering Illusions and the brand-new Preserving Mystery in size and style. Upon its release, Eric Mead praised Devious Standards in Genii magazine, declaring that, “The finished book is as beautiful as it is challenging, informative, stimulating and a genuine pleasure to read." "The Method Is Not the Trick,” ”Discovering Importance,” and "Empathy," as well as tributes to Billy McComb, Bob Read, and Martin Nash. The book also includes "A Dissertation on the Double Lift," Jamy’s thoughtful approach to this essential move, and a roadmap to improving your own double lift. ”The JS Rules of Magic” is a satire on the rules we follow in magic, and how to break them. And "The Last Layman,” one of Jamy’s most beautiful essays, is a cautionary, artistic parable about the future of magic. 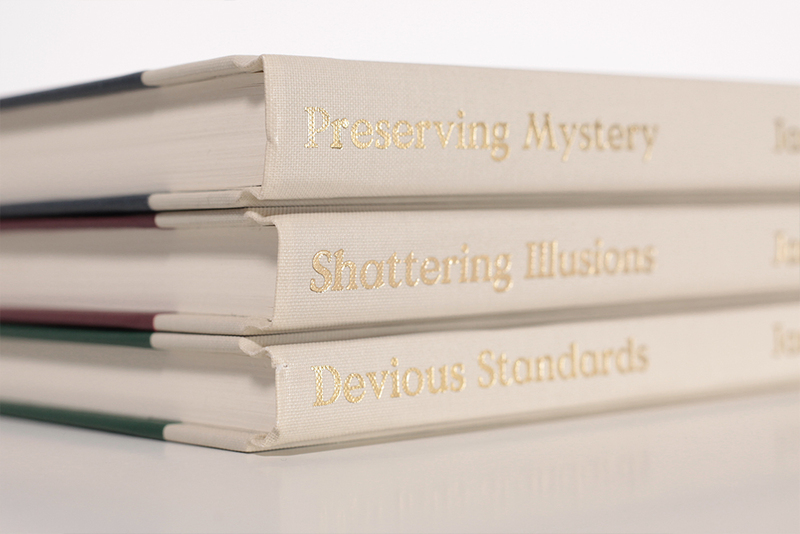 184 pages, hardbound with gold foil engraving.